Ok Ok here are some more pictures. Since my last post, here are the things that have been going on. They had to put the mesh stuff on the walls for the stucco to stick to. It has felt paper underneath to help reduce moisture. You can see the little bit of the stove pipe sticking out of the chimney. 2. The insulation guys came and put fluff and stuff everywhere. After reviewing all the insulation options available, mom opted for the sprayed foam. It had the best R factor for what we had to choose from. The spray it on the walls and it puffs up to 100 times in size. 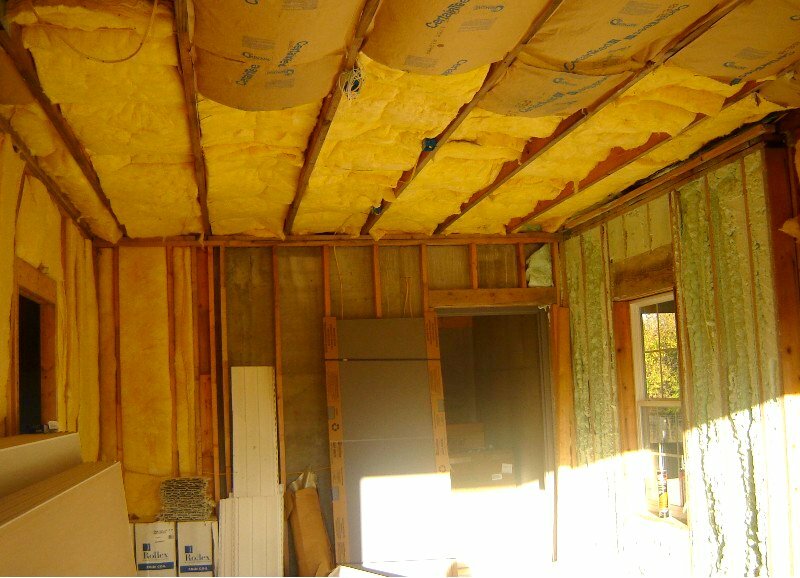 Mom had it put in the ceiling upstairs because it is the only efficient insulation for the type trusses we used. She also had it sprayed in all the exterior walls. They put batts everywhere they couldn't do the foam. 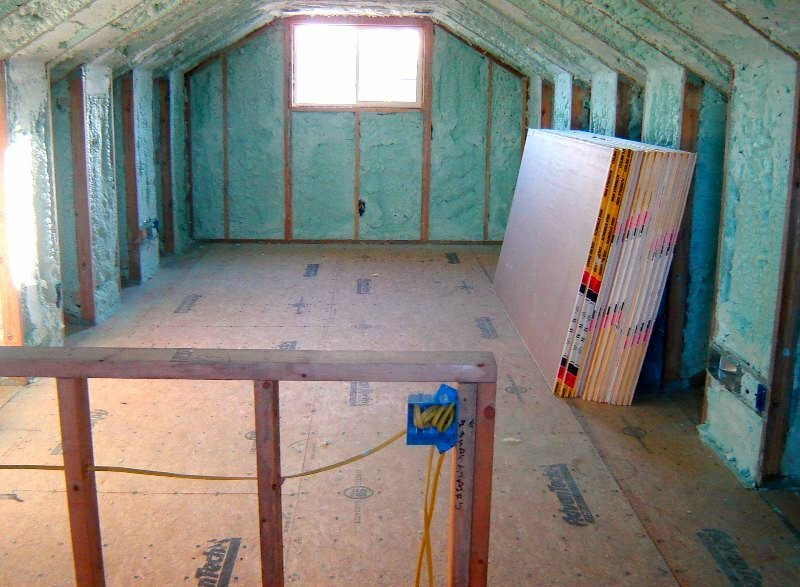 All the walls of the garage have insulation to protect the houses from the heat and cold. 3. I saved the best for last!! Eric is now our hero because he was actually able to get a dumpster so we can start cleaning up in earnest. What is so special about that? Well since the tornado of May 10th it has been near impossible to get a dumpster here. Lots of the construction crews have been near impossible to get too. Everyone has been backed up this year trying to get roofs on the tornado victims and building new houses to replace those blown away. It's looking good. Is the room upstairs going to be like a loft bedroom? That is not a bedroom. It is a storage room for mom. All the stuff in her house has to go somewhere until it is all sorted out. There are little cubbies there in the wall for putting boxes. It is really a nifty room. The stairs are also four feed wide so Bryan will be able to get most of her things up there without any trouble. If he can cary my 200 pound desk up and down the stairs with out too much trouble by himself now, then he should be able to get stuff up there with Joe's help. Looks good Lucy. Now when are you going to post more pictures. I only had 2 weeks off this time. In April I have 4 weeks off. Who know what things will be like then. When there are pitures to take and I have time to take them. Most likely at the end of the week.